Is a computer program that enables PC-compatible computers to operate as cash registers and as inventory control systems. In other words, Keystroke POS is a completely automated retail management system. Can be used to replace electronic cash registers, or to serve as the front-end for third party accounting systems. Is a much faster, more flexible means of entering Sales and controlling inventory than are cash registers. Offers far more capabilities than traditional cash registers and is also much easier to use. Is the perfect solution to improve the profitability of nearly any business. Thousands of independent retailers, wholesalers, service shops, and multiple-store chains rely upon Keystroke POS software and Specialized Business Solutions support services to help them manage their businesses. No wonder Keystroke POS is "The Clear Choice In Retail Automation". 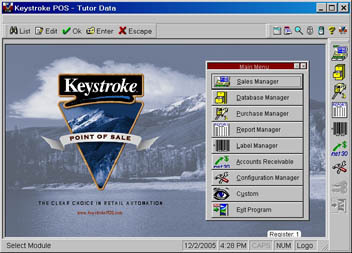 Keystroke POS has been marketed by Specialized Business Solutions since 1988. Watch this presentation for more details.